With consumers receiving so many solicitations in the mail every day, Visa needed an innovative package that would stand out among the crowd. Americhip worked with Visa and its agency to design a stunning, high-end welcome kit that truly meets the campaign’s positioning statement of “Prepare yourself for a truly premier experience.” The luxe design starts with the materials — gorgeous textured silver paper with silver foil highlights detailing the Visa name and logo. 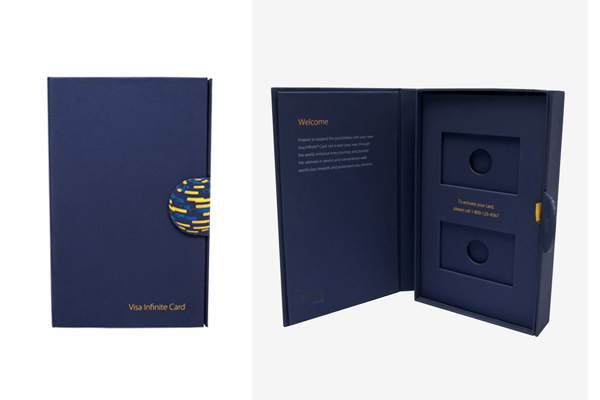 Americhip’s paper engineers designed a sleek tri-fold kit that closes tightly thanks to a clever wrap-around design including the Visa globe logo serving as a magnet closure on back. 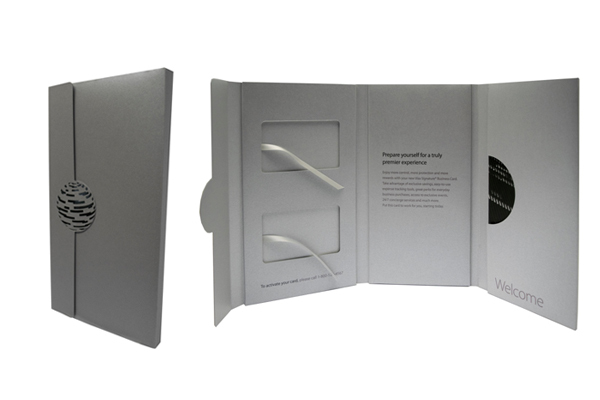 Once opened, consumers are treated to a clean and balanced lay out including wells for each card, easily removed with a silk ribbon, and a pocket holding a complementary journal. When you need to impress your new customers, turn to Americhip for an exquisitely designed customer welcome kit.